Conductive Thermoplastic Graphene/PLA Wire, a material by Graphene 3D Lab, is specifically designed to allow you to develop electrically conductive components by injection molding and other production techniques. The wire is a graphene-enhanced PLA-based material for use at room temperature and exceed the conductivity requirements for a host of applications. Conductive thermoplastic (plastic which can be easily molded when heated to a certain temperature) material is widely sought by industry for electromagnetic and radio-frequency shielding, static-dissipation, and anti-static applications; our wire is far more conductive than required for anti-static and static dissipation, and easily reaches the conductivity required for electromagnetic and radio-frequency shielding with a volume resistivity of 1 ohm-cm. 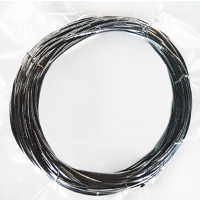 Conductive Thermoplastic Graphene/PLA Wire is polylactic acid (PLA) based. PLA is a thermoplastic which is biodegradable and derived from renewable resources, such as corn starch. Our graphene-enhanced thermoplastic wire is vacuum sealed and shipped with desiccant packs. Limiting exposure to water vapors will enhance processability. If, however, the wire is exposed to moisture, simply dry at 60 degrees Celsius overnight before processing. Our Conductive Thermoplastic Graphene/PLA Wire is designed to enhance electrical properties. Our pellets also offer thermal conductivity by a factor of 2 more than that of regular PLA.